The channel chair's classic shape is feminine and beautiful. Isn't it reminiscent of the sea shell from where Venus was born? Plus, doesn't it seem like such a comfortable and cozy piece? I'm really loving it. These vintage Maison Lancel sconces are SENSATIONAL! I love vintage pieces because aside from their rich history they have so much more personality. These would look stunning in an entry hall flanking a mirror or in a powder room! Someone please get them ASAP. 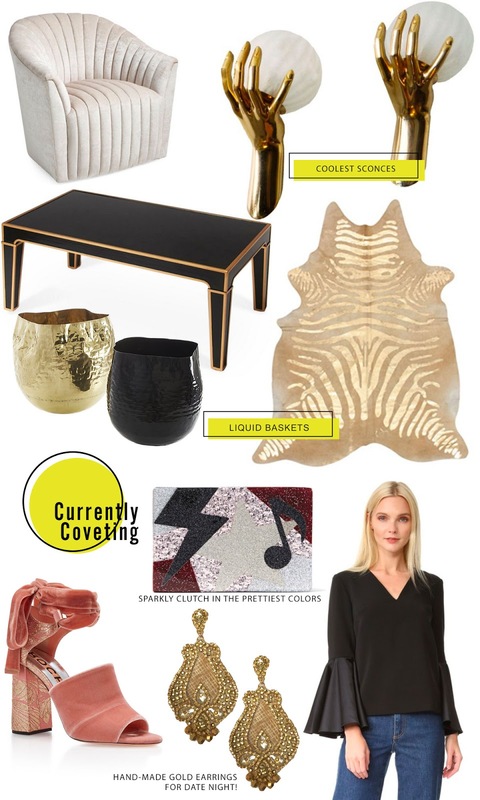 This chic and practical black and gold coffee table is pretty and can really dress up any living space. The gilded zebra rug is perfect to add some sparkle beneath a sitting area. My friend has it in her entry hall welcoming guests with a hint of modern glamour and it makes the space. These fabulous liquid basquets are so practical and edgy. You can place them beneath a coffee table with blankets or next to a fireplace to hold some logs. I would place mine next to my sofa and fill it with all the millions of magazines that keep accumulating. This elegant and very practical black top is like a work horse. You can dress it up or down depending on the occasion making it perfect to add to your travel repertoire. These gold earrings are beautiful and their large size will make you stand out. I have a few earrings from this brand and I adore them. I get tons of compliments when I wear them. Soft soft pink sandals! Swoon! Feminine and romantic. This acrylic clutch by Karl Lagerfeld is fun yet elegant and perfect to add some sparkle to your evening ensemble. Love this sconces!! So different! !